It is beyond time for an update! We survived the great move across the desert to the wild wild west when bubba was 6 months old and have spent a couple of months settling in. The house was ready almost as soon as we arrived and we moved in after only just over a week at Daddy C’s sisters’ house. I’m loving the house, the area, the city, the weather – everything! I even have a part time job Mondays to Wednesdays now, which is great for a bit of grown up time… not to mention pocket money! I’ve also met a few local mums. Daddy C has a high falutin new job and it’s safe to say the move is suiting us very well so far. We still have a bit of furniture to buy to kit the house out and the front and back lawns need landscaping… so it will be fun to get those things underway and see the house come together over the next few months. Bubba has grown up a crazy amount. The difference between 4 months and 8 months is immense and amazing! Seeing as I have let this blog lapse for far too long, I thought I would do a little month by month update of the last little while. 4 MONTHS: At four months, she was definitely still a baby. 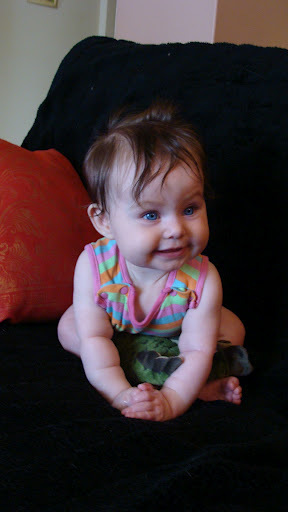 She couldn’t sit unaided, roll or move and still hated tummy time. 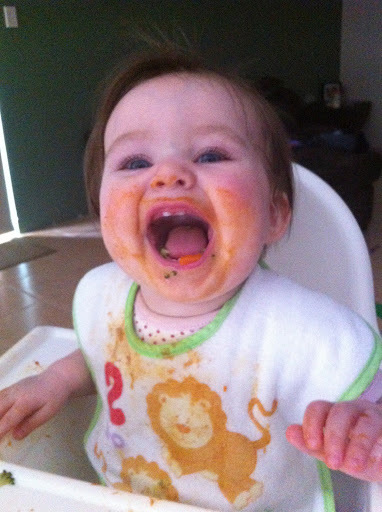 We started a bit of spoon fed solids around 4.5 months which she absolutely loved. Vocalising consisted mainly of squeals and some giggles. 5 MONTHS: Right toward the end of five months, she started sitting forward a little bit when propped to sit on the couch. However, she was definitely still way too unstable to sit on her own unsupported and there was still no rolling or movement. She was still enjoying her spoon fed mash and was starting to try to steal the spoon to do it herself. At the end of the month, we packed up the house in Melbourne, shipped our stuff, and then went to New Zealand for the week. Her sleeping started becoming very disturbed during this period – I’m not sure if it was an age thing or if she was sensing all the changes happening, but we started having difficulty going to sleep and night time wake ups again (after sleeping through since 9 weeks old!). 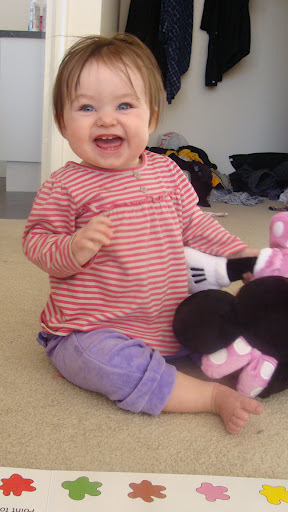 6 MONTHS: Bubba had her 6 month birthday on the plane from New Zealand to Perth! For the first week and a half, we stayed with Daddy C’s sister and niece while the house was being finalised. During this time, a lot of things happened in bubbaland! She started to prop herself up with her hands in a sitting position, although was still a little wobbly. She learned to roll from back to tummy and started sleeping in a side-lying position. 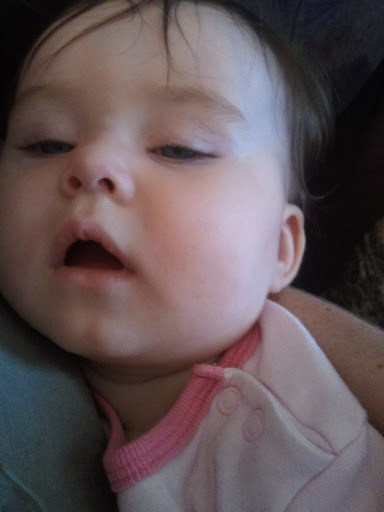 And she got sick for the first time, with a head cold. That was a particularly awful few days, all she did was cry and sleep and her nose was all stuffy. She would sleep for only 30-40 minute periods before needing cuddles and consoling again, right around the clock. It was exhausting and heartbreaking at the same time. Luckily it only lasted for around 3-4 days until she was back to her happy self. This was also the time that I weaned her from breastfeeding to bottle feeding, which was surprisingly easier than I expected, but I plan to write about this separately soon. By the end of the month, she was starting to sit better unaided , although still tended to fling herself backward without warning and get upset when she hit her head! She was also rolling happily both ways. We also got a highchair and began a fully Baby Led Weaning approach, with her eating only foods she could pick up herself. She absolutely loves it and it’s surprising her manual dexterity in getting food to her mouth. 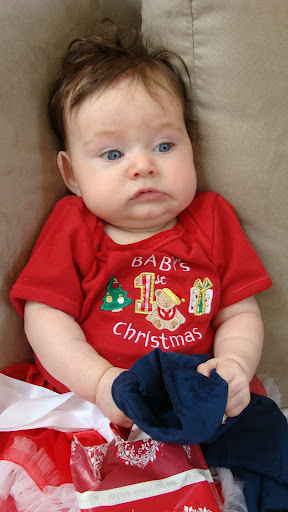 7 MONTHS: During this month, bubba’s sitting became much more confident, so that towards the end of the month, she was easily able to be plonked down in sitting position without fear that she would fall backward or sideways and hurt/stun herself. She started moving around in circles while on her tummy. And finally, a few days before her 8 month birthday, she figured out the inchworm maneouver! 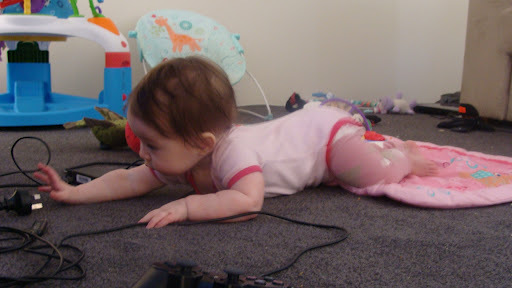 This move has come in leaps and bounds from the moment she figured it out and she now scoots all over the place, mostly in attempt to get at the power cords and playstation controllers, which are far more interesting than her actual toys! 7 (almost 8) months old and learning to inchworm… all because she wants the power cords! At around 7 months , Mum got her part time job and bubba started going to family daycare three days a week. This is where another mother takes some children into her own home during the day, as opposed to using a big childcare centre. I am really happy with this smaller, more one on one approach, the lady lives just around the corner from us, is absolutely lovely and I feel her approach to caring for babies is similar to mine. I feel really happy leaving bubba there and I actually feel that she is thriving on all the stimulation and contact with new people and things. Enjoying her food at family daycare! 8 MONTHS: Well, now bubba can commando crawl, there’s no stopping her! She may not have figured out the “all fours” concept yet, but her funny little dragging frog-swim motion gets her surprisingly far! If it’s on the ground, she’s gonna find it… and probably try to eat it. Speaking of eating, she loves her fingerfood and eats like it’s going out of fashion – she prefers solids to a bottle most of the time! She now has four full teeth and four little half-teeth inching their way out of her wee gums. 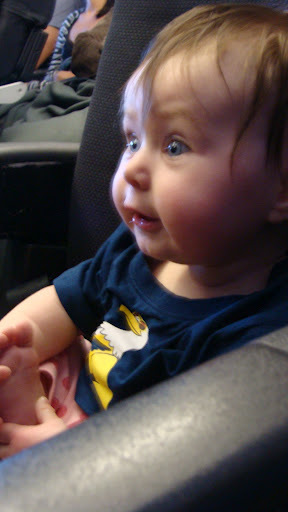 Her babbles consists mostly of “Dadadadad”, “Mummmm!” and “bubub”. She loves a good chat! Some of her favourite things include: fresh plums and strawberries, power cords, harrasing the cat, turning down the surround sound while we’re trying to watch TV, pulling mum’s hair (and dad’s! ), trying to play with the Wii remotes, trying to eat paper… and basically anything that involves being a cheeky little wriggler or eating food! Adjusting to parenthood has been a hard road for me. 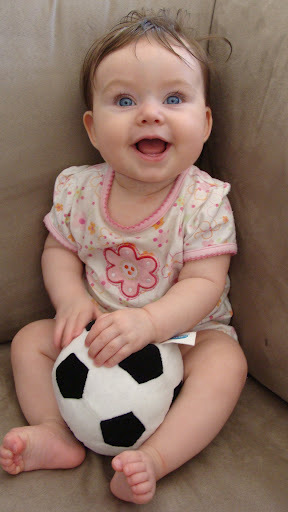 I think I didn’t realise in the beginning, having never spent much time with babies, how rewarding it would become. She is such a little person now, and getting so big. She is so funny and makes me laugh every day. It’s still hard and I still get frustrated every day too. But she is beautiful and fun and crazy. And now that I’ve walked the path, I even miss her snuggly little newborn days, despite the lack of sleep it came with, and wish I could go back and appreciate her more rather than be so wrapped up in my own struggle. But I can’t go back. So I just love her now. I’m not perfect… but she is, even when she’s not. She’s growing up so fast, I can’t even imagine what it will be like when she’s walking and talking… but I guess I’ll find out soon enough! Where did my little baby go?! Em, she is perfect and looks just like her gorgeous mum!! Love that last photo showing just how big she's getting. She looks happy and healthy, and I can't wait for more posts about motherhood and life in general!